Hello and Greetings to you. I am wanting you to have a look at these X-rays, and give your best guess as to the diagnosis. The chosen WINNER will get a complimentary manual of Veterinary Secrets. This was a 7 year old Lab cross, with a 2 month history of coughing. He had less energy, and seemed tired. He tested negative for heartworm, other blood tests were in the normal range. We’re accepting answers until Friday, 6PM Pacific, and will announce the winner(s) Saturday morning. looks like the dog only has a lung on one side – is the other lobe collapsed? I am guessing the 7 year old lab mix is suffering from heartworm, even thought the blood test showed negative. It takes 4-7 months for heartworm to test positive in the blood. The heart appears somewhat enlarged. I would re-test for heartworm. Just a guess: enlarged heart and beginning heart failure, leading to fluid buildup in the lungs, leading to lowered energy and coughing. My guess about the diagnosis is congestive heart failure. The answer is enlarged heart, heart disease. I think the white spots in the dogs xray could be scar tissue and it could also be from second hand smoke. Cardiac myopathy – hypertrophy leading to CHF? The Lab had swallower a ball or lemon and it was stuck just above the stomach. This blocked food intake and pressed on lungs restricting breathing. An alternate is a tumor or cancer in the esophagus. he has a mass in his chest, eitehr a tumor though it looks not attached so perhaps he swallowed something? I’m going to say that this lab mix swollowed something that he was chewing on. As we all know who owns labs, they like to do that. That could probably cause the coughing and being so tired because he isn’t able to breath properly. do i detect a micro fracture, located where a humans sterum area is? It looks like a normal x-ray to me. tumor in his lung. ? The heart is enlarged, he has heart disease. Just a wild guess, my son’s dog recently had bronchitis and exhibited those symptoms, only he was much older. looks like he swallowed something, maybe a ball. this dog must have swallowed something, like a ball or a sock & it is stuck in there. I would guess pneumonia. thank you. It looks like a mass in his stomach, or he ate a tennis ball, sock or something. This Animal ingested something. the Xray shows, an object lodged. I think the lab has swallowed a stone! Is it a tumor in the stomach? I am sure you ruled out a tumor. So I would guess with the coughing, he may have ingested something. Was this an enlarged spleen? I think the dog swallowed something. At first I thought it might be an inflated ballon but changed my mind about that. Now I think it is fluid in the lungs. I hope the dog got better. Please let us know the outcome. Hopefully I will win the book because I sure could use it with 7 small dogs. Did he swallow one of his toys? This dog has congestive heart failure. Perhaps is it Kennel Cough? Could that be a very large pulmonary tumour? A dog’s x-ray is quite different from a human’s, so I’m not sure where the heart is, or the stomach for that matter. Hope the poor dog can be helped, Dr. Jones. Take care. either an Enlarged heart or a growth in The chest cavity ????? The poor dog only has one lung! well, according to the case statements, it´s a large breed middle aged dog, with trouble breathing normally and coughing, though blood testing shows normal and heart worm neg., looking at the X-rays a DILATED CARDIOMYOPATHY would be my best guessing. By the way, thanx a lot for the daily mails they are both interesting and useful, I´m argentinian living in Peru now and we´re all huge fans of your site here, keep on doing this excellent job!!! I think the dog has pneumonia. I think he had Bronchitis. He seems to have a mass in his abdominal cavity. He could have eaten something that lodged in his intestinal tract, or a tumor. With little info given, I’d guess allergies. I would think he has a problem with his heart. My guess on the x-rays are that the Lab was playing or chewing a toy Kong that was too small for him to chew and should have had a much bigger one. and he swallowed it! I think this is what I see..in the x-ray…. hope this is the correct answer. It looks like an obstruction OR some type of growth. Look forward to hearing what the diagnosis is. I’m taking a wild guess–enlarged heart? I think that poor puppy has a pneumonia. I hope he is treated quickly. Hi Dr. Jones, I’m thinking this might be bloat. It looks like a growth – perhaps a tumor, hopefully not cancer. Stomach torsion can not be, since is terminating in 1 day. I suppose is a tumor on the lung or in the surrounding ( liver may be as well) compressing the lungs therefore causing the cough. My guess is he either swallowed something (a sock?) or he has a tumour…but I’m sure you figured it out without any problems! With nothing to compare to I would guess an enlarged heart. The poor Lab Cross might have had swallowed a cup. ? I think he is having a fever. I would use H2O2 1 drops in a glass of water every 4 hours or colloidal silver 1 tsp 4 hourly. I guess lab has enlarged heart, indicating heart problems. This looks like a sponge that the dog swallowed. I think he has congenital heart disease, an enlarged heart and fluid in his lungs because his heart is unable to pump efficiently and it looks enlarged. Looks like he has an enlarged heart. Could be a heart murmur, valve defect. I believe that the dog may have an enlarged heart. looks like he swallowed a wad of paper towels! My guess would be the dog swallowed a ball. Kindly, let me know. Thanks. I believe he has an enlarged heart due to congestive heart failure. 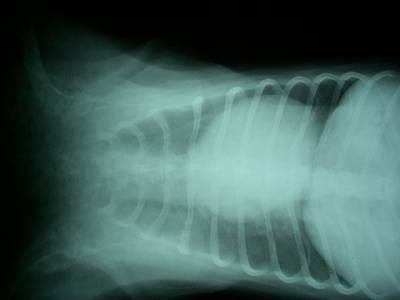 The dog x-rays. Dog swallowed an object. Possibly a ball. Maybe tennis ball. I’m going to guess enlarged heart. My guess is kennel cough. I am not sure, but it maybe something he swallowed and his stomach cannot digest, or it could be a tumor. Of course my initial thought is a cancerous tumor in the lung, but that seems too obvious. So after a bit of thought I think the dog has inhaled something , such as a fox tail, a marble, a piece of a raw hide he was chewing on or some other object that was small enough to pass through the nasal passage and lodge in the lungs. This item has been attacted by white anitibodies and has created the mass in the lung area over time. Whatever it is I hope it’s not serious and that the dog recovers quickly without long term effects. A severe case of my first gue, ckennel cough, would be dog influenza or dog flu. My diagnosis from looking at the Lab’s x-rays would be an enlarged heart. Fluid in the lungs? My new cat had a very stuffed up nose and cough so wouldn’t eat. After syringe feeding him and too many visits to a mainstream vet, x-rays, and drugs that did not work, someone told me to give him Natrum Mur #9. I purchased the pills (which moves fluid in the body to more appropriate areas) at the health food store and gave them to him every 20 minutes (recommended for cats in acute cases)for 2 days as much as I could. His breathing was better in approx. 4 days and he started to eat. PS he then had acupunture and an immune system booster from an holistic vet. I would guess that the lab X has congestive heart failure. I’m guessing he ate something that got stuck, like a soft toy, or the stuffing from the toy. My best guess, an enlarged heart from congestive heart failure/issues…..
A tumor in the trachia/oesophagus above the stomach. The lab has a big heart than a normal one. As a result his heart is in a very close proximity with his other internal organs. His heart cannot pump normally because it is now bumping into other organs. HIs heart then needs to work overtime to produce oxygen. The result is he is having a hard time breathing, making him cough,and making him tired. My diagnosis is : Water on the lungs. My diagnosis would be congestive heart failure/enlarged heart. I have been dealing with this with my oldest dog, “Ky”. He is doing well on meds and his cough has substantially been reduced by prescribed diuretics, etc. He just turned 14 and was diagnosed over 18 months ago. I’m grateful for the meds. P.S. I’d love to win the manual. I’ve been reading your terrific information for awhile now and am grateful for your emails. I’ve learned alot!! Thank you so much!! My guess is an enlarged heart. I know this poor lab swallowed something that is imbedded and I pray it can be easily removed and relief this precious companion to move on with his life comfortably. I would say some kind of ball. I’d guess cardiomyopathy. The heart is enlarged so it’s probably not working very well. That would explain the coughing and the listlessness, too. allergies? is the dog exposed to tobacco smoke? My DX would be foreign object! 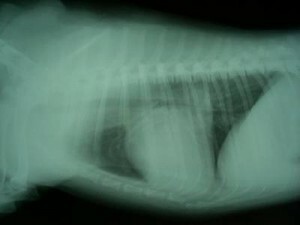 I believe that the poor pup swallowed either a ball, or some type of toy that is not passing through his system! Enlarged Heart pushing against the lungs. I was going to say, this poor lab seems to being having congestive heart failure, but it looks like there are alot of us that seem to think this is the diagnois, so I doubt I will win the book, and as much as I would love to have it, my main concern is for the lab. Please let me know what the outcome was for this wonderful animal, another of God’s beautiful creations!! Thanks for all you do to help us keep our pets healthy! If he has trouble breathing could an object have gotten into his lung? Lack of energy would tell me the dog is somehow unable to get nutrition from his food. Coughing (is it dry, hacking cough, or other? ), not sure but, assuming there is a blockage in the digestive tract, the dog is trying to cough/vomit it out. I don’t know how to read x-rays… I’d venture a guess this Lab has either managed to swallow a ball/toy, or developed a bezoar in his tummy. In either case, I’d see a vet ASAP. I guess a mediastinal mass with lymphadenopathy. Heart disease. I thought my comment went through three hours ago. A grass seed/s in the lung maybe. I would guess he has some type of cancer. I think he swallowed a rock. It looks like he swallowed something like a small ball or a toy. I’ll go with that. Looks like cancerous growth pressing on the esophagus and causing the cough. I don’t know how to read x-rays, but maybe he has only one lung. Since I can’t see any other organs, I would guess he only has one lung. It looks like a small football he might of ingested. I hope he is alright and you were able to remove whatever it is. If you flipped th dog in a standing position it would be more prone on his left side. I say it could be an enlarged gall bladder, or a blocked intestine. Looks like it is pushing up on the lungs. Looks also like it is something that dye was used to get a correct immage. If it were liver problems, liver enzymes would show up in the bood. Could it be an abdonimal aneruerism on the side of an aorta blood artery? In any event I hope the dog has recovered. Heat Disease. My dog is suffering from the same thing. Only she is a lot smaller. I think this dog as CHF or Cardiomyopathy-enlarged heart. Sounds a lot like my Saluki, who has epxanded cardiomyopathy. The dog swallowed something – possibly a ball (or rock)he/she was playing with. the black is lungs. white is bone or organs … the heart seems awfully large. could be congestive heart failure or other heart-related issue. I’m going with an Aneurysm. My guess is congestive heart failure. my initial guesses would be some type of heart disease (ie, chronic heart failure/other), bloat, heartworm, some type of obstruction and/or bronchitis. Even though you state the dog has tested negative for heartworms, you did not indicate the type of testing performed. Most commercial tests will accurately detect heartworm infections with one or more mature female heartworms that are at least 7-8 mos old, however, the tests might not detect infections of less than five months duration. Plus it can take up to 6.5 months after being bitten by infected mosquitoes before a dog might test positive for heartworms, especially if they have not been on appropriate heartworm prevention. This is a fun one doc but I don’t know how to read xrays… Was thinking bloat but I’m going to say he looks like he’s missing a lung. It looks like the dog swallowed a toy–a ball of some kind. having lost a wolf-chow mix 3 years ago of some of the same symtoms,I would like to guess it could possibly be a lung bulla. Hoping he recovers no matter what and thank you for your great information and for stand ing up for what you truly believe helps our wonderful animal children and wildlife ! Looks like heart disease (heart is enlarged). I don’t know if you want us to be more specific. After readubg through 163 opinions, what is the correct answer? I think this dog has lung cancer. This looks like what my cat had, and she also coughed and had to breathe with her mouth open and could not sleep as she had trouble breathing. Xray looks similar to her xray when diagnosed with lung cancer. We do not smoke but she was old 16 and was very healthy, but then our other old cat died at 19 and a month later after he died, she started coughing, and the surgery would only give her 90 days to live, so we had to say goodbye as the vet didn’t think she would survive the surgery. It was very sad as it was so unexpected. She was so healthy her entire life that we thought we had another 5 years with her. It was a tough Christmas losing one before Christmas and one shortly after Christmas. Heart Failure.Hugely enlarged heart pressing on chest wall.My guess CHF. I think his heart is enlarged. The coughing is caused by the constriction of the lungs and since his lungs can’t expand properly he can’t get enough oxygen. That is why his energy level is low. Aspiration pneumonia for sure if she swallowed something. Possibly lung cancer type of tumor. The dog has a thimble inside his lung. Hi I think this puppy has swallowed a plastic cup and it is lodged in her chest. I know this sound silly but they do swallow the strangest things. Swallowed a sock and it’s stuck somewhere betwixt and between the dog’s stomach or bowel ? It looks like it may be a tumor. It looks like the dog inhaled something… a toy perhaps. Instead of swallowing it went down his esophagus and into his lung. My dog did that with dog food. Husband shined a flashlight through the window while the dog was eating. Startled the dog and he started barking while he was eating. A morsel was sucked into his lung. Next day he coughed so hard it flew out of his mouth. The dog has a collapsed lung. My first impression is that he has an enlarged heart. If he is coughing it could be CHF. Poor baby. Hope you can help him. I had a Chihuahua with CHF. She also breathed really fast and that was what alerted me to the fact she was sick. I think he swallowed a toy. Ruptured Diaphragm with abdominal contents pushed up into the lung space. Happened to my dog. Symptoms indicate Heart Disease or Fluid in Lungs. Hope vet can make the dog more comfortable. Rheter. Could the dog have swallowed glue? Once ingested, water activated glue will expand hand get hard. The only way to save the dog is to surgiiically remove it. Enlarged heart with fluid, likely a partial collapsed lung. Is it a broken sternum? I think it could be tracheal collapes. Enlarged heart or congestive heart condition? Enlarged heart is pressing against the trachea or windpipe, causing cough. Congestive heart conditions cause the tired feeling, less energy. My guess is enlarged heart, which is pressing on his lungs and causing decreased oxygen in his system. I would say the Lab is much overweight and the stomach is pushing up against his heart causing his breathing problems. I am no vet, but I would say that this poor pet has non-hodgkins Lymphoma and can cause all kinds of illnesses as heart failure. Perhaps the dog also has an enlarged aorta. possibly have swallowed a small piece of rawhide that went into the chest cavity instead of the stomach causing congestion, the nagging cough of trying to expel the foreign object, also not knowing from what part of the country this 7 yr old lab is from it could be desert valley fever that leaves a dog lethargic, coughing, congested lungs, elevated white cells that attack within the lungs etc and could create a mass from the mold spore cells that were ingested internally, most likely running a fever as well with being lethargic. Prognosis – not good, unless under specialized and intensive care by someone as good as you, Doc! an enlarged heart pressing against the trachea,causing the cough….congestive heart failure. looks like he swallowed or breathed in a balloon! This looks like Tricuspid Valve Dysplasia (TVD)as indicated by the enlarged right side of the heart. It is not Mitral Valve Dysplasia as the left side of the heart would be enlarged instead. Is it a enlarged spleen? The cough is usually the first sign (accompanied by dry hacking) of a failing mitral valve, an enlarged heart and the consequential build-up of fluids into the lungs and pressure on the windpipe.The pet gradually -but often quickly- tends to display lassitude,a dwindling appetite, a difficulty breathing, perhaps constipation, and in his last days, weakness, less control of his limbs and a fast variable pulse. In particular, as an early symptom, the pup will display a bloated stomach more obvious when laying down. Of course,xrays which display a rounded shape as shown are usually definitive of CHF. after having to visit my animal doctor again I change my guess. My new guess is a Collapsing Tracia. I am going to make a guess and say the lungs look good, so if that is the stomach, the Dog ate something to cause bloat, if that is a , then it is quite enlarged due to fluid build up. If it had a bloat from twisted gut, it would not have lived that long, but enlarged heart would cause a cough. Also so would an enlarge stomach from swalling something large, it could cause the cough and depression from being against the lungs. My guess would be CHF due to enlarged heart. I would say the Lab ios much overweight and the stomach is pushing up against his heart causing his breathing problems. my guess is enlarged heart..cardiomyopathy. Sorry for the duplicate entry. I’m going with Enlarged heart. Looks similar to the x-ray of my dearly departed Himalayan who had an enlarged heart and kidney failure. Hard to treat them both effectively, but her heart was super sized and super fast. Looks like an enlarged heart, so I would guess congestive heart failure. It looks to me like he swallowed a plastic cup,possibly a medicine cup off pepto bismol or something like that,or even a larger one but still I think it is some sort of plastic cup. The heart is enlarged. The contour however is very rounded. Could it be there is fluid in the pericardial sac? Heart enlargement can have many causes, so can pericardial effusion. And thank you for all the wonderfull e-mails. I am greatful for all your information you share with us. Thank you. I have to agree with the people who said enlarged heart/heart failure. Is he eating well? If he didnt get better or worse over the two months, is it perhaps a potato he has swallowed? This dog has two sets of the same organ born with an xtra organ not picked up as a puppy. One organ works and the other makes the dog unwell. I think it could be Pneumonia. I would say congestive cardiac failure. The dog ingested something – perhaps a sock? I think it might be a congestive heart problem, & pneumonia making it hard for the dog to breathe. fluid build up around the heart, likely caused by a virus or parasite. To me it seem he has a shadow around his heart which has some extra fluid, giving the heart the appearance of being slightly enlarged. It would be interesting to know if a pericardial friction rub cold be detected. Therefore my guess would be pericarditis. Pericardial effusion.Fluid in the sac around heart.Many causes most likely viral. Seems be fit the symtoms. I’m with the swallowed a ball crowd. I agree with those who think dog swallowed something (?). Lungs are suffering thus the cough and letharghy. Poor guy. poor guy of course he has a hard time breathing! It looks like he somehow managed to swallow a turkey baster. I think it is congestive heart failure. Is it an enlarged heart and congestive heart failure? Looks like a large mass above the stomach, still in the esophagus. Above the stomach (not gut) because the ribs are surrounding it. Must be something he swallowed. Almost looks like a plastic cup. If in the trachea he would not be breathing. Looks like heart disease his heart is enlarged an that puts pressure on the airways causing a cough. Hope all is well with him. There is no cancer. Masses show up black on x rays. I think the poor dog just has a mass poop. The lungs i believe are on the right of the x ray. So this would mean you cant see the heart. And i dont see any exit way. So the possibility of swallowing something or not digesting something is my best guess. Take puppy on a walk/jog and might get it out. It looks like a tumor. This lab has an enlarged heart with blood diversion in the lungs suggestive of heart failure & cor pulmonale – increased fluid build up in the lungs as a result of the heart failing to pump efficiently has caused the cough & lethargy. The primary cause of the heart failure I am not sure of….so CCF. later spreading to the brain leading to encephalitis and seizures. The dog ate something like his ball. Typical lab probably chewing on a small toy or food and either swallowed or inhaled it and it is stuck in the esophogus or lung causing the coughing. Did the dog swallow a small toy that lodged in his esophogaus and gave him less oxygen. I would guess that he wasn’t eating as well as he should. Since he is a lab, he probably ate and swallowed a rock or stone. Some labs never learn but love them anyway… His food does not contain the necessary nutrients, thus eats/swallows non-digestible things, such as this rock/stone. I would guess congestive heart failure. I had a dog with it and so does my husband! It appears to me that it’s an enlarged heart, esp. with the coughing symptom and age factor, I would suspect congested heart failure. Hi Doc, It looks as if the heart is enlarged and it looks as if there is fluid build-up in the lungs. The dog is coughing because it feels as if it is drowning in the fluid. The coughing is a gagging reflex and should not be confused with kennel cough. For treatment I would give blood pressure medication as well as a water tablet as to reduce the discomfort of the dog and clear the lungs. This dog can live many more years to come provided it stays on chronic med’s. If treated the lethargy will disappear as well. Regards, Alida. I guess it’s a liver problem.Maybe even a tumor. The liver is too large,and it’s pressing against the lungs. Looks like a balled up sock. I think he swallowed a toy of some kind, maybe a kong. Swallowed a stone which was too large to pass through. I would test again for Heartworm using a serology test instead of Microfilaria test. If this also came back negative then I would guess pneumonia. Your info is sketchy at best not enough to go on to be accurate.This being said,CHF is my first concern.If the canine has been progressivly tiring over a period of time with labored breating that would signify congestive heart failure.The x-ray or ultrasound will confirm this.What throws me off is coughing for two months,I never seen this in CHF cases.I would have to guess and go with a enlarged heart possibly due to a tumor. He’s swallowed a couple of stones. Hi My guess is a stomach turned over, common in labs. Thank God I have never had this problem but I’m learning a lot having 2 labs now and having one passed from cancer 2 years ago. Ingested a piece of rawhide which expanded in his intestine and is pushing on this diaphragm. My guess is torsion, twisting of the the stomach due to rapid eating and too much activity afterwards. I would guess it’s a hairball. I think that mass in this Labs gut is swollen yeast. Labs are nuts for ‘people’ food like most other dogs, but this looks like it ate raw dough that has since ‘risen’ causing pain and listlessness and pressure when its lungs expand. Did he swallow a ball? If everythign looks to be in the normal range,,,Could this be something as simple as kennel cough? Looks like fluid build up in the lungs cause by torsion of one of the lobes? It looks like he has swollowed the bulb from a baby asperator. (What they use to clear babies noses with). Enlarged heart/heart disease, overweight lab perhaps? This dog is suffering from Canine Dilated Cardiomyopathy. Looks like he might have swallowed a sock. I’m not even sure what I’m looking at, but I’d go along with the enlarged heart/congestive heart failure. Would help those of us who aren’t used to seeing X-rays to see what a NORMAL x-ray looks like. It looks like the heart either enlarged so much that it pushed the lungs down into the abdominal cavity or this poor dog actually did have heartworms and they were so massive that they forced the lungs into the abdominal cavity, I don’t know, it just looks odd to me like things aren’t where they’re supposed to be. Though I’m not really medically inclined I’m just guessing. But when I really look at it & since I went from being a dog person (due to losing my spirit guide dog in 1995) to being a cat person it actually reminds me of a hairball. So oddly I’m thinking that maybe it’s somehow a hairball because I have a tiny cutie kitty who had a cough for a month or so, was low on energy & seemed tired until I started doing the simplest thing. My vet suggested a small amount of olive oil. Now he’s doing great!